Beginning each performance with their trademark greeting, "Mighty fine and a great big Western 'Howdy,' all you buckaroos and buckarettes," Riders in the Sky simultaneously pay tribute to and poke gentle fun at the classic cowboy songs of the 1930s and '40s, particularly the work of the Sons of the Pioneers, Roy Rogers, and Gene Autry. During the '80s and '90s, the group was notable for its ability to attract fans both firmly within the country tradition (the Riders are members of the Grand Ole Opry) and outside of it. Riders in the Sky are made up of lead singer Ranger Doug (born Douglas B. 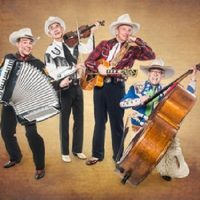 Green), Woody Paul (born Paul Chrisman) on fiddle and vocals, Too Slim (string bass and guitar), and since the mid-'90s, "Cowpolka King" Joey Miskulin on accordion.